Eating less (or no) meat now or perhaps considering it? If so, the variety of vegetarian protein sources available will no doubt please you. Although many of us may need less protein than once believed, we still need to pay at least some attention to our intake. Because, unlike omnivores who can get big (and quick) shots of protein from animal flesh, vegetarians generally meet their protein needs in smaller and more-frequent doses. Still, the protein grams do add up when you pay attention. And, as noted, good vegetarian protein sources are findable for many: seitan (not for the gluten-intolerant); dairy products (if you're not vegan); faux meats; tofu and other soy products; grains and legumes. Vegetables also contain protein, although many of us forget to factor those in. On this page, however, we feature two common plant-based proteins: soy products and seitan. 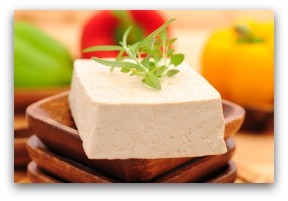 Both unfermented (tofu) and fermented (tempeh) soy products can be good protein sources for many. Tofu, for example, provides roughly 10 grams of protein per half cup. Perhaps you eat tofu already; if not, could its texture be putting you off? I used to eat quite a lot of tofu and unfermented soy products myself—sometimes as often as once a day. However, I’ve cut back to three or four times a week now, if that, as some pro/con debate has arisen over the unfermented forms of soy. In addition to tofu, these would include certain “faux” hot dogs, sausage, etc., as well. Before leaping totally onto the soy bandwagon, you may wish to do some research on the issue yourself. 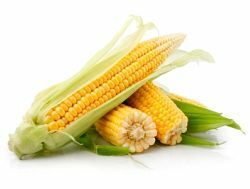 You can find what seems quite a balanced treatment by clicking here for an article by Kathleen DesMaisons, Ph.D.
Fermented soy products such as tempeh and miso, however, are said to be a somewhat different matter. Tempeh, created through controlled fermentation of cooked soybeans with a Rhizopus mold (tempeh starter), generally comes in the form of a dense cake. Although its appearance may seem odd at first glance, tempeh has a pleasantly firm texture and a nutty, mushroom-like flavor. Tempeh can be sliced and fried or steamed or baked to pop into soups, spreads, salads, and sandwiches. Great stuff, tempeh, once you get used to its "properties." Click here to find out how to make it yourself. Dense and chewy, seitan is made from wheat gluten—which puts it strictly off-limits for anyone with gluten intolerance. 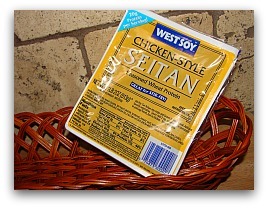 But if you have no such issue, you may find seitan a useful addition to your diet. It's been a life-saver for me on occasion. One-half cup of seitan contains roughly 30 grams of protein and adds a tasty and nutritious element to many dishes. If you make it at home, you can better control the sodium content, which gets out of hand with some commercial versions. You can often find gluten flour, its primary ingredient, in grocery and natural food stores (at least in the USA. If not, you can generally buy it online. Remember, too, that seitan, tofu, and tempeh are but three of your choices; grains and legumes are also among the better vegetarian protein sources. The fact is, vegetarians have far more choices than many realize, and if one of those was you, some new tastes now await you (in addition to some old favorites). Enjoy!